Blogging is one of my favorite things. I do blogging for fun and to make money. It’s true you can make a lot of money with blogging. But you need to work hard and the decision for your work. There are so many internet marketers who are making thousands of dollars with blogging. Today, I’m going to talk about how you can make money with a micro niche blog. Let me give an introduction about micro niche blog. A micro niche blog is a small blog where include all the information about a tiny topic. These niche targeted blogs rank higher in search engines rather than other non-targeted blogs. 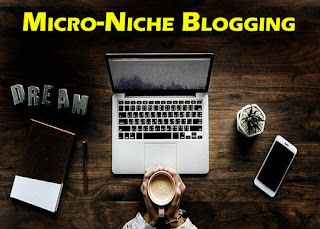 Here is how you can create a micro niche blog. You need to select a niche that you are interesting and comfortable. You have to think about what the best and trending topics in that niche are. Find what are the topics which popular in both the UK and USA. If you can target these countries your earnings will increase rather than other countries. There are so many popular free and paid tools which you can use for analyze google search, cost per click, popular and competition. You need to get a full SEO audit report before getting started. Another important thing is you need to buy a keyword related domain which should include your main keyword. But careful selecting those domains. EMD is very harmful when google identify you are going to hack their algorithm. This is the most important step in your whole work. You have to separate your time doing keyword research. You can use SEMrush, Longtailpro like paid tools to do advanced keyword researches. But you don’t have to pay money, you simply use free tools like google adwords and google trends. When selecting topics, you have to consider whether that topic has the same demand for a long time. Timely popular topics are not important. Choose the ideal keywords and make titles according to them. Use Image Alt tags, permalinks to include your keyword. Include your main keyword in 2-3 places in your article. Keyword density is important. It should be less than 2%. Start your topic with some specific words like what is…, how to.., advantages and disadvantages…, important facts…etc. Starting from these words catches readers to your blog. I recommend you to start your blog on WordPress. It is easy to manage and it is search engine friendly. Get a perfect domain and you have to connect it with a hosting account. I suggest you try Hostgator. It’s easy to set up WordPress into your hosting account. Then you can set an eye-catching theme for your blog. Genesis is one of the best WordPress themes for a blog. Then you can install essential plugins like Yoast SEO, Akismet, Auto Post Thumbnail...etc. You need to do all the customization to keep with you. Start social media channels for your brand name and set up them in your blog to follow easily. You can use the Yoast SEO Plugin to produce SEO friendly articles. Don’t forget to add a subscription box to catch email subscribers. Fill the About Us and Contact Us pages very clearly. Share your contents in all social media channels. You also need to build some backlinks. Social Bookmarking, Forum Posting, Blog Commenting are the easiest methods to build to quality backlinks. But first, you need to submit your blog to search engines like Google and Bing. When you receive niche targeted traffic you can start monetization. Google Adsense and Affiliate Marketing are the best methods for Micro-Niche blogs. Apply Adsense after produce some great articles. Then you can do affiliate marketing with Adsense. I hope now you know how to make money with a micro-niche blog. But most of them failed to start. Don’t wait to start and begin the journey today. I wish all the best for you.